Our legal rights as workers are complicated, and understanding how to respond to violations can be challenging. 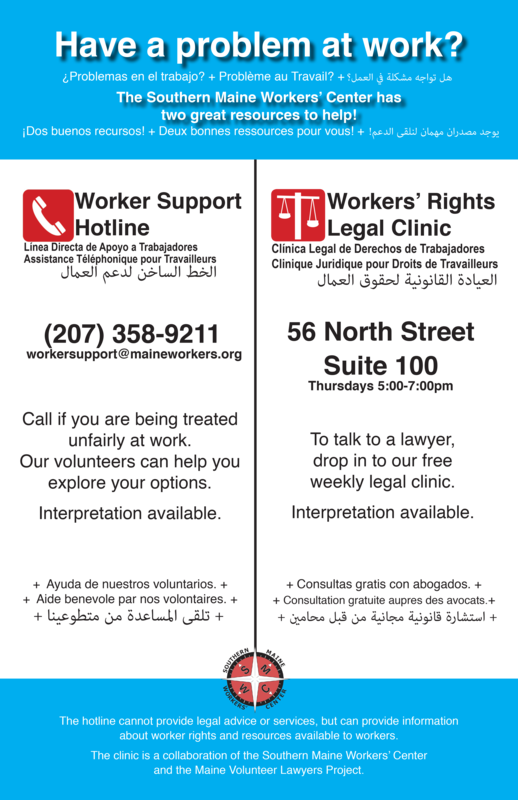 The Southern Maine Workers’ Center can provide legal information to help you understand your rights. We can also refer you to legal advice, when necessary. While it is important to win individual legal victories, we recognize that often when we ourselves are facing an injustice at work, so too are our coworkers. When we take action together we can improve conditions for everyone. The Workers’ Center can help you and your coworkers organize to address grievances in the workplace. Give us a call and leave a message or send us an email if you have questions about your rights at work or organizing in your workplace. A member of our dedicated volunteer Worker Support team will get back to you. Disclaimer: This hotline is intended to provide information about your rights, to connect you to legal resources, when possible, and to help you think about ways to organize to change your conditions. This hotline is not a substitute for legal advice. Visit the Legal Clinic to talk to a lawyer about issues you’re facing at work. The clinic is free and no appointment is required. Interpretation services are available. The clinic is a collaboration of the Southern Maine Workers’ Center and the Maine Volunteer Lawyers Project.